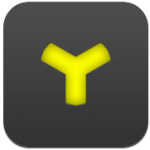 VoiceJam Studio is a Looper, Vocal FX Processor, and Audio/Video performance recorder. Record up to 4 fully independent loop tracks with up to 8 minutes per loop. Loops are automatically synchronized using industry proven sync modes: Beat Sync, Loop Sync, Serial Sync, and Free. Sync modes can be used in any combination across all loops. 50 Vocal Effects from TC-Helicon – the leader in vocal processing – offering a full pallet of production quality effects giving you real-time control of the vocal path at your fingertips. These effects include, Hardtune, Gender Bending, Chorus, Flange, Transducer, Distortion, Delay, Reverb, Echo, Doubling and Micromod, just to name a few. Capture your total performance and never lose the groove. Sing through FX, create and layer loops, evolve them, tear them down, mix, filter, trigger, and scrub them at will. Every aspect of your performance is captured including audio, video and all your app-interface interactions. Share the resulting music video with your friends, your fans, and the world on Facebook, YouTube or SoundCloud. 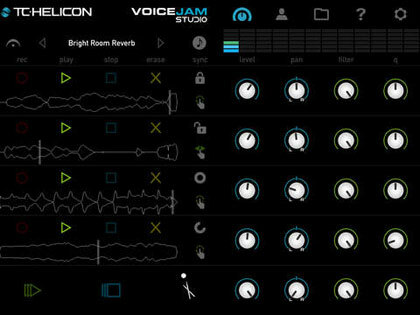 VoiceJam Studio takes you to the leading edge of looping with the ability to connect with other apps through Apple’s Inter-App Audio, AudioCopy, and AUDIOBUS. It also synchronizes to external MIDI devices. This means that you can choose your favorite drum app to start your beat, go to your guitar app to lay down your chords, and stream all of this into VoiceJam Studio to continue to build more depth into your performance. 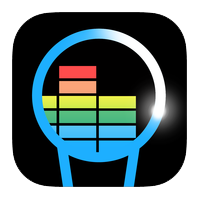 – Share your music to Facebook, YouTube, SoundCloud, or your local camera roll. Voice Jam Studio is the world’s most powerful Vocal Effects Processor and Looper app. Capture your creativity and share it with the world right from your iPad. The perfect tool for any vocalist, whether exploring a musical idea, recording in a studio, or playing live. This is your vocal studio, you can bring it anywhere. 50 Vocal Effects from TC-Helicon – the leader in vocal processing – offering a full pallet of production quality effects giving you real-time control of the vocal path at your fingertips. These effects include, Hardtune, Gender bending, Chorus, Flange, Transducer, Distortion, Delay, Reverb, Echo, Doubling and Micromod, just to name a few. These very same effects are used by some of your favorite musicians. Record up to 4 fully independent loop tracks, with up to 8 minutes per loop. Voice Jam Studio can automatically keep all of your loops synchronized to the beat even if they are different lengths or if you trigger them at different times. Voice Jam Studio also synchronizes to external MIDI devices to allow it to be used in combination with other MIDI controllers and sound generators. Get started by choosing your beat sound from the built-in metronome, tap your finger to set the tempo, and create perfect loops with ease. Capture your total performance and never lose the groove. Sing through FX, create and layer loops, evolve them, tear them down, mix, filter, trigger, and scrub them at will. Every aspect of your performance is captured including audio, video and all your app-interface interactions. Share the resulting music video with your friends, your fans, and the world on YouTube or SoundCloud. Voice Jam Studio takes you to the leading edge of looping with the ability to connect with other apps through Apple’s Inter-App Audio, AudioCopy, and Audiobus. It also synchronizes to external MIDI devices connected to the iPad. This means that you can choose your favorite drum app to start your beat, go to your guitar app to lay down your chords, and stream all of this into Voice Jam Studio to continue to build more depth into your performance. Voice Jam Studio works best with headphones. VoiceJam was created by TC-Helicon, the world’s #1 professional audio company dedicated 100% to the needs of singers. Fiddlewax Yellow is a live vocal harmony generator, effects processor, and looper all rolled into one. Create your own music from the ground up using just your voice and whatever is around you! Realtime harmony lets you create and layer sounds as fast you can think of them. Unleash your imagination and build awesome audio tracks in seconds. * Realtime 3-part vocal harmony using our very own super fast, polyphonic, pitch-shifting and audio analysis pipeline. Sing and synthesize new sounds and audio textures on the fly. * Built-in effects to add chorus, distortion, reverb, low-pass, and high-pass filters with the push of a button. Quickly transform your voice into other instrument sounds as you play. 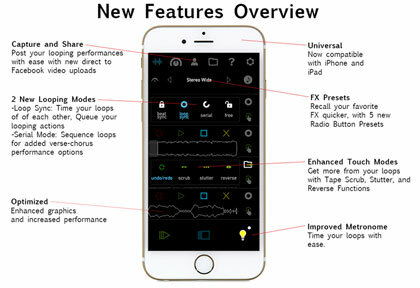 * Synchronized, auto-expanding looper to layer up to 6 audio tracks at once. Easily start/stop any track and clear tracks individually when you want to overwrite/undo. * Integrated recording function to save and share songs. Send to other installed apps, attach to email, or download later from iTunes when you sync your device. * Low-level core audio implementation makes everything run super fast and robust (built using The Amazing Audio Engine). * Headphone-aware control logic reduces the chance of squeaky feedback while you record. * Great for all experience levels, from beginners to experts. * Precision interface optimized for 10-finger multitouch. 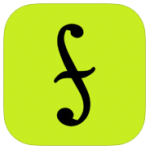 Give Fiddlewax a try, and amplify your inner voice.